Pea Fritters are not just for babies. 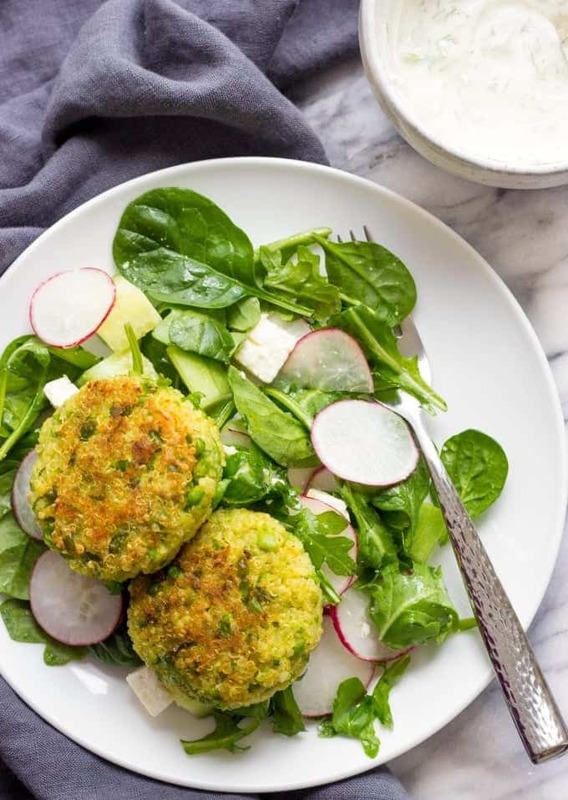 These delicious protein and healthy-grain packed patties make an easy and healthy 30-minute weeknight lunch or dinner. Is it just me or spring can’t come soon enough? I’m so over this gloomy and cold weather. I’m sure you feel the same way and just like me anticipating warmer weather. My daughter goes to preschool 3 times a week and one time a week to gymnastics. In such weather getting out of the house with her and infant is a hard task. Just a thought about dressing everyone up, transferring that extremely heavy car seat in and out the car, makes me dizzy. That’s why I anticipate warmth like never before. I’m sure you will agree with me. Everyone feels better when the birds are signing and flowers are blooming. Speaking of spring. Despite that weather is still very unpredictable, I feel like my whole body is ready for healthier meals. How about you? I’m sure you had lots of comfort food this winter, hadn’t you? :) And it’s okay. During winter, we all want to feel warm and comfy and there’s nothing like a bowl of creamy potato soup with bacon or chicken casserole. But now, with the arrival of spring, my stomach craves healthy and apparently it’s not just me. Facebook and Pinterest food trends are telling me the same. I’ve been receiving messages about a demand for healthier recipes and you know what? You want it, you got it. These Pea Fritters With Greek Yogurt Sauce And Radish Salad are such a healthy and delicious meal. Green Peas are an excellent source of protein and other nutrients. They are very versatile and can be added in a variety of vegetarian dishes for an added protein. You know what the best part of this recipe? 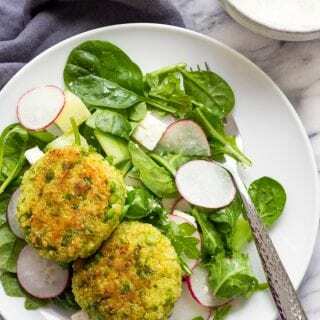 It will take you no more than 30 minutes to whip it up and you can enjoy these Easy Pea Fritters for lunch or light dinner. Along with the fritters, I’ve made a super quick and delicious radish salad. Radishes have a slightly spicy and fresh taste and pair perfectly with green peas. I chose mixed greens as a base for my salad, but you can also use arugula or spinach. In a small sauce pan, combine water, quinoa and ½ teaspoon of salt. Bring to a boil, then reduce to simmer, cover with a lid and cook the quinoa until it absorbed all water and is cooked through, about 15 minutes. In a large mixing bowl combine green peas, cooked quinoa, egg, spices, Panko, Parmesan and lemon zest. Mix well. In a medium non-stick pan heat olive oil, enough to cover the bottom of the pan, about 3 tablespoons. 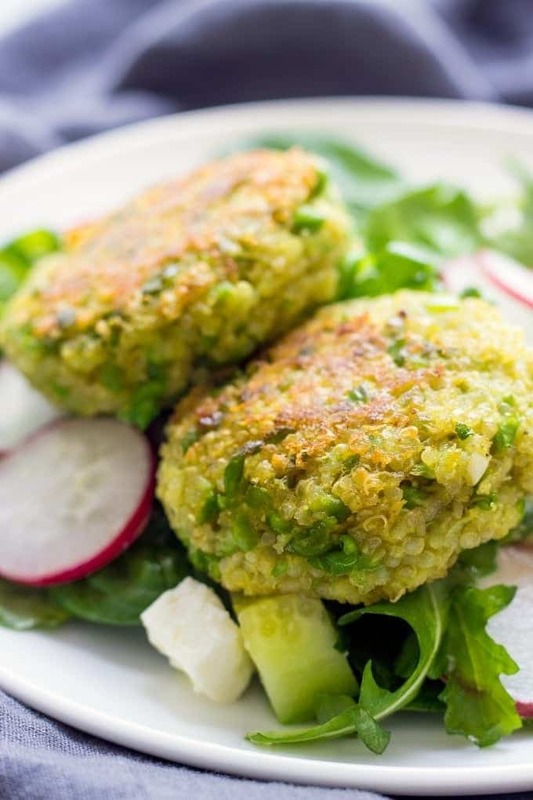 With your hands, take about ¼ of a cup of quinoa pea mixture and form small patties. Fry for 3-4 minutes on each side until nice and golden from the sides. Transfer to a paper towel. In a small bowl, combine all ingredients for the sauce and serve with the fritters. In a medium mixing bowl, combine mixed greens, cucumber, radishes and Feta. Drizzle with olive oil and season with salt and pepper. I just love all the components in this recipe..the radish salad, greek yogurt & the pea fritters..yummm!